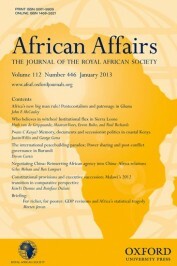 A quick scan of issues of the most highly-ranked African studies journals published within the past year will reveal only a handful of articles published by Africa-based authors. The results would not be any better in other fields of study. This under representation of scholars from the continent has led to calls for changes in African universities, with a focus on capacity building. It is, however, important that these initiatives to build the capacity of Africa-based academics are accompanied by micro-level efforts to encourage and strengthen academic debate and collaboration within institutions. The barriers to research and publication in most public universities in Africa are many and have been extensively documented. They include heavy teaching loads, poor infrastructure, political interference, low salaries, and the lack of research funding. These problems are compounded by the fact that many universities do not reward research or publication in high-impact journals, and continue to value quantity over quality when making decisions about promotion. These barriers have contributed to the creation of spaces in which academic debate and the thoughtful critique of scholarship doesn’t always thrive. Many scholars have few opportunities to discuss their ideas and to receive essential feedback from members of their immediate academic community. Consequently, the development of ideas and the subsequent writing-up of these ideas for submission to journals sometimes happen with little or no input from colleagues with shared interests. Working in this manner doesn’t only cause scholars to miss opportunities to improve upon their work, but makes it difficult for them to develop their departments and research centres into spaces of research excellence. Various organizations and universities have introduced initiatives to address some of these problems. The recently launched African Research Universities Alliance (ARUA) seeks to build research excellence in universities across the continent. The University of Ghana, where I am a research fellow, offers research and conference travel grants. The university’s Office of Research Innovation and Development is staffed with dedicated people who support researchers to apply for external grants. The Council for the Development of Social Science Research in Africa (CODESRIA) also seeks to support scholars, by organizing research and academic writing workshops. These initiatives are a much-needed step toward dealing with some of the challenges facing many academics. Scholars, who seek to conduct original research and to publish in high-impact journals, should complement these macro-level programs with micro-level efforts, such as departmental seminars and reading groups, to foster discussions and collaboration within their units. While these forums exist and are vibrant in many African universities, my conversations with colleagues in Ghana and elsewhere indicate that not all units have them. Furthermore, they are not always geared toward improving the work that is being done by members of faculty. Academics in many African universities confront multiple barriers to research and publication. These are problems that cannot be addressed without major structural and managerial reforms. The objective of these forums, whether they are limited to members of a department or open to faculty and students from across the university, should be to help each other produce theoretically-grounded, methodologically-rigorous, and interesting work that answers important research questions. They should occupy a central place in the activity of all departments and research centres, and in addition to teaching and mentoring, should make up the institution’s lifeblood. Scholars should develop these forums alongside their personal networks. One of the first things I did when I joined the University of Ghana was to begin connecting with scholars – some of them senior – who shared some of my research interests, and were producing interesting work in high-impact journals. In a short time, they have become a small community of people whom I rely on in various ways. Among other things, we share information such as call for papers, discuss our research designs, and receive and give feedback on work-in-progress. I am also collaborating on several projects, including a multi-country study, with members of this community. I have also connected some of them to members of my international networks in order to facilitate information exchange and collaboration and they have done the same for me. A community in which informed and vibrant debate and constructive criticism thrives is important for all scholars. While some scholars are able to get feedback from conferences and from personal networks they have built over time, others do not have access to these resources. Furthermore, spaces in which rich conversations and exchange occur are critical for the training of doctoral students and for the development of ideas that will solve policy problems on the continent, shift paradigms, and challenge the status quo. Academics in many African universities confront multiple barriers to research and publication. These are problems that cannot be addressed without major structural and managerial reforms. As universities begin to introduce some of these reforms with the support of various organizations, academics in these universities can also try to foster discussion and exchange within their individual units. Although a collaborative environment is not a panacea, it can provide much-needed support to scholars, who work under difficult conditions, but want to conduct research and publish in international peer-reviewed journals. It is, therefore, up to such scholars to begin to strengthen their communities. Featured image credit: sunset birds cloud sun sky by AdinaVoicu. Public Domain via Pixabay. Peace A. Medie is a Research Fellow in the Legon Centre for International Affairs and Diplomacy (LECIAD) at the University of Ghana and an Oxford-Princeton Global Leaders Fellow. Her research centers on the dynamics of violence during and after conflict and the efforts that state and non-state actors make to address this violence.